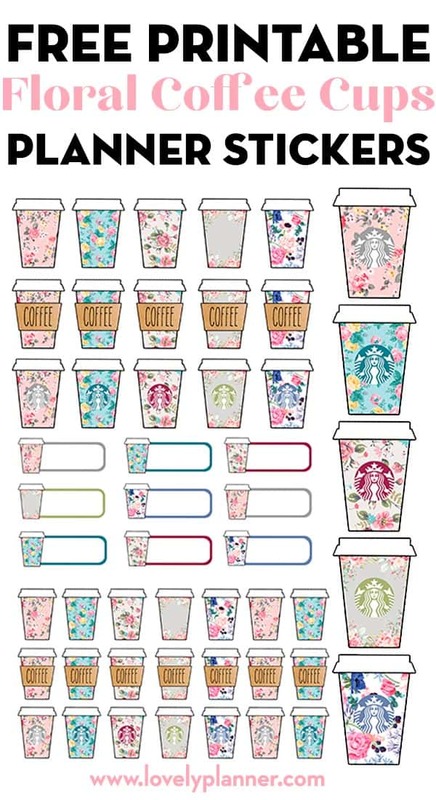 In the past I shared with you guys a set of Starbucks Cups Stickers, Christmas Starbucks cup planner accessories and Fall Starbucks Cups stickers that you seemed to like a lot! 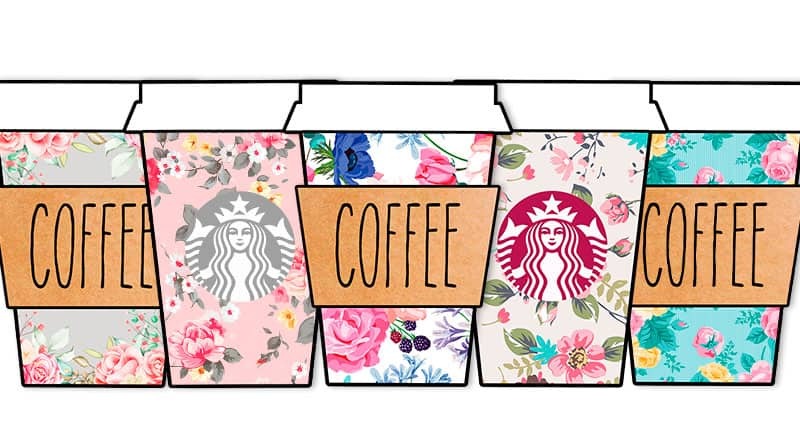 So I thought I would share with you a new set of stickers inspired by everybody’s favorite coffee place, but with a more feminine feel to it to celebrate spring and everything floral. 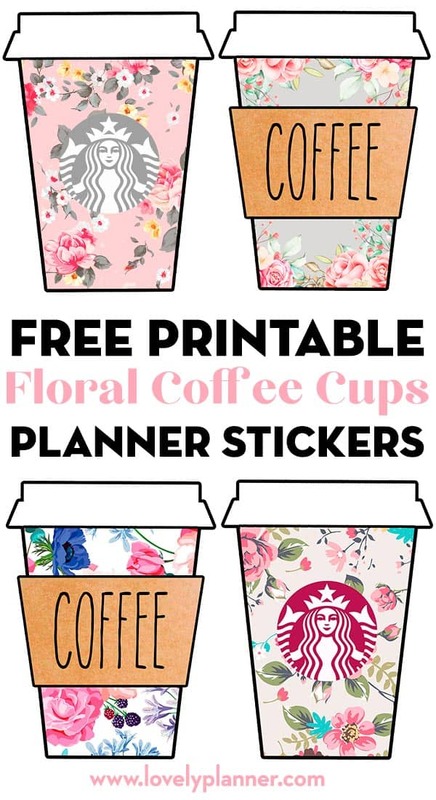 I’ve created 5 different cups , designed with adorable floral patterns and turned them into Floral Coffee Cups printable stickers for your planner. Each of the 5 different cups in 3 different versions: simple pattern, with logo, and with COFFEE written on it. I’ve mixed different sizes for these 50 stickers so you can use them in different ways. 9 cups with space for notes – to write how much you spent on beverages or keep note of a Starbucks date for example. Or just to write down any event or appointment. 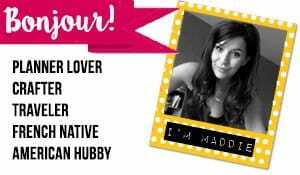 Here’s a preview of what’s included. Pin this image if you’d like to save it for later! You can download the file further down this page. How to save money and earn cash back on your online purchases ? If you’re planning on buying some of the items needed for this project online here’s a great tip to earn cash back, find coupons and save money easily. Before buying anything online, I always check out Ebates (either with the browser extension or on Ebates.com). I find the store name (type it), click the current deal for that store and complete my purchase. When completing a purchase through Ebates you earn cash back that you can have mailed to you or sent via Paypal. If you have never used Ebates you’re missing out. Click here to sign up for Ebates, and RIGHT NOW when you sign up, you will receive a $10 cash welcome bonus when you spend $25.00! Since you were already going to complete your purchase online, why not get some cash back on things you planned to purchase!